Despite major losses on the Nasdaq for national fast casual brands like Chipotle, Panera Bread, and Noodles & Company, fast casual emerging brands like Freshii, Corelife Eatery, and Sweetgreen are growing. Foodable defines an emerging brand as a concept that finds itself at the beginning stages of development, whether it’s just launching or it’s working through the minutiae of scaling and expansion. 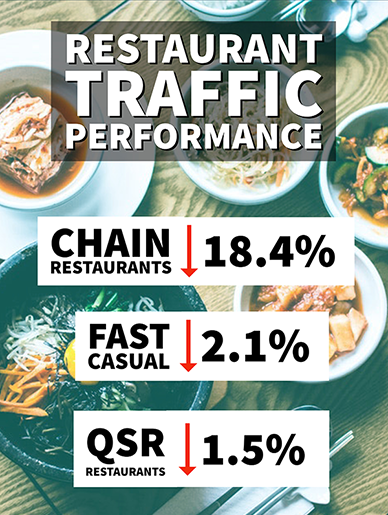 According to Foodable Labs, restaurant traffic overall has gone down 6.8 percent year over year, based on social media mentions of the top 1,000 chains, while emerging fast casual brands have seen an 8.2 percent increase in restaurant traffic. Nasdaq claims that fast casual is a dying trend, but we believe this is just a shift in the trend. Emerging brands can’t stay an emerging brand forever, eventually, they begin to scale and gain notoriety across the nation, if done right. National brands like Chipotle are simply seeing natural market forces. They face greater competition as they continue to expand, as well as more challenges. Whereas an emerging brand is just beginning to build brand recognition. Emerging brands are more nimble when they’re smaller and face less scrutiny. To learn more about what that exactly means for restaurants, be sure to watch the video above and download the Top 150 Emerging Brands Report. Once upon a time, fast casual chicken restaurants were a dime a dozen- the packaging might have been different, but the tastes were largely the same. We talked to two trailblazing companies on their approach to chicken and what they're doing to set themselves apart from the competition. In this episode of Fast Casual Trends TV, brought to you by the Foodable Network, Host Paul Barron sits down with Paul Damico, EVP & Group President at Focus Brand Restaurants. Damico explains why Fresh Mex — and ethnic, in general — has mass appeal when it comes to the fast-casual format, what effects the rise of QSR+ may have on this segment, and what upcoming trends we should expect to see in the space. In this episode of Fast Casual Trends TV, brought to you by the Foodable Network, host Paul Barron is joined by McAlister's Deli President Carin Stutz at the Fast Casual Trends & Directions Conference. With the sandwich segment being a powerful emerging leader in the fast-casual space, how does a 26-year-old brand stay competitive in an ever-evolving market? What ingredient trends does McAlister's Deli follow? And how do they engage with both new and loyal consumers to stay top of mind? Watch the full episode to find out all of the above, and more!